Weightlifting is very different from running. The range of motion and the intensity vary. That’s why you need a different set of gear (especially shoes) for each activity. And as with most things in life, having the best weightlifting shoes and equipment can help you give your best performance. First, why should you have a different set of shoes for weightlifting? Can’t you just use your old running shoes? Many people think that it’s all right for it to be the same. Maybe it’s because in a normal course of workout day, they will be doing a wide variety of activities. However, weightlifting requires a different set of motion. That’s why the designs of weightlifting shoes and running footwear are often different. Overall, each one is optimized according to a specific function. This way, you can maximize your performance and prevent any injuries. Experienced athletes and weightlifters know this first hand. Beginners often only pay attention to arm strength to effectively lift weights. But the feet and legs also do their part. As you watch (and if you’ve already done it), the feet and the legs also exert much force. How they move and how they exert force also dictate whether they can effectively lift the weight or not. To maximize your performance, you need to choose the best lifting shoes. How do you accomplish that? In this comprehensive guide, you will learn about what specific features to look for. While discussing each feature, you’ll also learn tips that many experienced powerlifters apply. This is an important feature. You need to feel it’s a secure fit whenever you’re weightlifting. This way, you will have more focus and mental resources on the activity itself instead of worrying about your feet. It will also help you enhance your performance and achieve your performance objectives. That’s why it’s essential to choose the right size for you. In addition, the feet should be firmly locked into place. Some shoes have an integrated lacing and additional closures for that purpose. When lifting weights, especially in powerlifting, the feet should be stable and secure so that they can aid you in exerting the best effort as you can. This is also an important feature especially if you have specific goals about weightlifting. You always need a reliable companion, whether it’s just for practice or for competition. This way you can stick to your plan and routine and attain your objective within reasonable time. That’s especially the case when you’re planning to compete. If your shoes break or become far from functional, it will derail your efforts and make you back out from the competition. Even if you have a spare pair, durability is still important so your confidence and focus will stay intact during the competition. Your mindset is also important when it comes to weightlifting. And one thing that can affect your mindset is the design of the shoes you’re wearing. It seems a small thing. However, you can’t underestimate the power of mindset. A confident attitude can help you a lot during powerlifting (and even in life as a whole). It can effectively increase your capacity and improve your performance. With a pair of excellently designed shoes, you might already feel like a winner. The feel and the look can contribute to your confident mindset. You will also feel that you’re wearing the best pair, which also contributes to your overall well being and performance. Let’s get a bit technical. This is where you can readily notice the difference between weightlifting and running shoes. Weightlifting shoes usually have a raised heel. This feature specifically helps you get into a better position so you can effectively lift a weight. You might be wondering: how does it work? A raised heel can help you get into a deeper squat (which means more potential energy and a wider range of ankle motion). It can also somehow help you get into a more upright sitting position. The biomechanics makes more sense that way because the goal is to lift the way all through up. In powerlifting and most sports, you can’t just rely on strength alone. Getting into the right position is equally important if you need to optimize your performance. This way, your feet and legs can greatly help you. More muscles will be there to help you lift the weight. These features also contribute to the confidence and focus you will have during each powerlifting session. You need to feel stable especially on your feet because these are the ones with full contact on the ground. They will also exert much force so it’s probable that the feet might get into an unstable position (after a few small movements). This will affect your positioning and your overall effectiveness. As mentioned earlier, it’s important to have a secure fit. In addition, the heels and soles should have integrity so their positions won’t be compromised. If their positions are not ideal, your performance will be affected and there’s an increased risks for injuries. Feeling comfortable is also important. It’s hard to focus on the practice or competition itself if you’re feeling uncomfortable. Instead of full focus on the weightlifting, you will get distracted by the discomfort. In addition, it’s a bit discouraging to have uncomfortable shoes. You might become less motivated to practice the sport. It becomes an additional hurdle to overcome which might wear you down. The goal here is to enjoy and endure the weightlifting. You should get rid of any unnecessary hurdle so you can fully enjoy the sport. This way, all your mental resources will be devoted to developing your strength and excelling in weightlifting. Now you’ve learned what specific features to look for. You’ve also learned the value of focus and confidence so you can optimize your performance and beat your peers. Next is you will learn about the strengths and unique features of different popular weightlifting shoes. This way, you will be better equipped to choose the best ones according to your needs, goals, and preferences. This is designed to be very durable and reliable. It’s made from leather and heavy duty black nylon mesh which are both strong materials. You’re confident that you can count on the Pendlay Do-Win whenever you’re out there doing powerlifting. As mentioned earlier, heel height is important in improving your positioning. It has a ¾ inch heel height which is preferred in Olympic lifting. You can be sure that the height is ideal for you to get the most out of your feet and leg power. The single sole design is a recent innovation. This helps in making the sole strong and flexible. The combination of strength and flexibility is important in sports and in footwear as well. This way you can rely on its durability while at the same time providing you with a range of comfortable motions according to your needs. Some experienced users said that these shoes are highly durable. You can use them for a few years and still won’t show a sign of wear and tear. Well, in most cases you will use this once up to three times a week. The strength and durability of these shoes are already enough for common weightlifting use. It was also mentioned earlier that having a secure and comfortable fit is also important. Some users have reported that these shoes are especially designed for people with wide and normal width feet. It’s important to take note of this so you will feel comfortable when you start wearing it and doing weightlifting. This is a lightweight and yet flexible powerlifting shoe. In addition, the Nike Romaleo 2.0 has a contoured TPU heel wedge that cups the heel for a secure fit. It’s like it’s especially designed with all the powerlifter’s needs in mind. To further help with securing the foot, the integrated lacing and two large hook-and-loop closures are also there. You will be sure that your feet are properly positioned whenever you’re wearing these shoes. As mentioned earlier, there’s still some flexibility even if the feet are held firmly. That’s because of the elastic added to the top of the shoe. This way, your feet can still flex freely, which is important when you’re moving towards the powerful lift. There’s a bonus. In each pair you will be provided with two insoles. One is stiff for competition and the other is softer for training. You can also use them alternately depending on the comfort level you need. It seems comfort is the priority of this shoe. That’s why there’s also a flat rubber outsole to minimize wear in the heel. All of these features combine to make you feel stable on the ground and feel the ultimate comfort. It will be your reliable companion whether you’re doing squats or dead lifts. You will always feel stable and you will feel a strong drive towards lifting. A pair of this is comfortable and it will also help you optimize your performance as a weightlifter. This is one of the most popular weightlifting shoes out there. The Adidas Performance AdiPower is especially designed to help maximize the performance of each user. From the features mentioned above, you can readily infer that this one is top of the class. It combines durability, function, and quality. Weightlifters can readily feel the difference. It’s no wonder why it became one of the most popular. Each detail is included to contribute to the overall performance, each with a purpose that it does really well. These shoes are known to be narrow. This way, you will feel a snug fit and you will feel secure whenever you’re wearing the shoes. After wearing it once, it will adjust to the contours of your feet so you’ll feel comfortable, even if you have wider feet. This one also prioritizes comfort because of its comfortable textile lining. It’s not only the material that dictates the comfort. Often, it’s also how all the materials were put together. You will feel the linings every time you wear the shoes. It’s a good investment especially if you’re planning to do weightlifting as your main focus for next few years. You need a reliable set of companions so you can practice it without delay and excuses. These shoes are good for those purposes. This one also provides a secure fit to your feet so you’ll always feel stable whether you’re doing squats or deadlifts. This one also covers the basics because it’s durable and helps people achieve maximum power. However, it’s specifically designed for CrossFit workouts. The exercises are widely varied which may only contain some powerlifting. It’s not focused on the weightlifting itself. This means aside from power, the Reebok Crossfit Lifter can also provide agility when you’re doing other physical activities outside of lifting. It has a better design than the other weightlifting shoes mentioned above. However, there are a few features that should be present which are only specific to weightlifting shoes. In this shoe, the heels were made such that they have some kind of cushioning. This is good for running shoes where your feet will have to endure impact. But for powerlifting, a firm heel is what you need to maximize your performance. 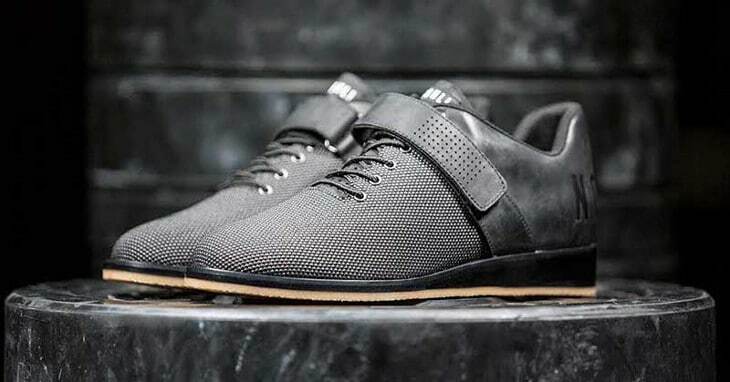 If you’re more into CrossFit or you’re not into competitive weightlifting, this shoe might suffice. But if you will prioritize weightlifting over any other physical activity, it’s good to stick with other shoes specifically designed for powerlifting. This is also one of the most popular powerlifting shoes out there. One main reason is that it’s specifically designed and configured for weightlifting. You can be certain that this one will help you get into proper positioning and exert the right effort whenever you’re squatting or deadlifting. The wedge heel height is ideal. This will help you get into an optimal position and improve your form when you’re lifting.The midsole wedge also helps in providing you with stability. This is important because during the most intense moments, stability can greatly help you successfully lift the bar. An additional feature is the single instep strap for added rearfoot integrity, which also helps in achieving stability so you can stay safe while you lift. You also don’t have to worry about its durability and reliability. It’s made from synthetic leather upper. In addition, the shoe also provides additional comfort because some parts of it are made from mesh which promotes air circulation. If you’re doing weightlifting for some time and you feel some knee pain, it might be good to switch to this shoe. It has a lower heel height that might be ideal for some powerlifters. It’s good to consult a physician about this so you can prevent pain and injuries. Some beginners are skeptical about the unique features of weightlifting shoes compared to the ones made for running. But when you try these shoes, you will instantly feel the difference. You will feel more power and experience more stability as you lift weights. When it comes to flexibility, there’s the meta-flex technology that provides extra movement to the forefoot. You will feel this when you’re walking or transitioning to the ultimate lift from below. You will feel comfort and your feet will be spared from unnecessary sprain. When it comes to stability, there’s the external heel cage and power-truss technology. These features help the Inov-8 Fastlift 325 in providing lateral stability. This way, your feet and body weight will have a stable base especially during those most critical moments when lifting. To further provide stability and security, the Met-Cradle lacing system and strap are added. These provide mid-foot lockdown that will help when you’re on the move. All of these features add up to provide you superior speed and power when it comes to weightlifting. In addition, this could be ideal for beginners who want a reliable shoe from start until they progress to heavier lifts. That’s why the shoes you choose should prioritize those factors. Weightlifting shoes should add power by having a raised and strong heel (for improved positioning). Stability is also important because you need to rise up firmly with your feet planted on the ground. Having the right footwear can actually make a difference. It’s not just about the strength of the arms. It’s also about mindset, getting into the right position, and maximizing your performance by getting help from your feet up. Aside from the specific features mentioned above, what other things are you looking for that you think will help you optimize your performance? Do you have insider secrets that will help other readers when it comes to powerlifting and footwear? Please tell us in the comments below.